Today marks the 100th anniversary of the assassination of Archduke Franz Ferdinand (heir to the throne of the Austro-Hungarian Empire) and his wife Sophie in Sarajevo, Bosnia and Herzegovina. The first assassination attempt of throwing a bomb into the back of their open car was unsuccessful, but did succeed in killing another officer instead. A few hours later the Archduke and his wife were shot at point blank range. Sure enough, within the week the “Great War” had begun. 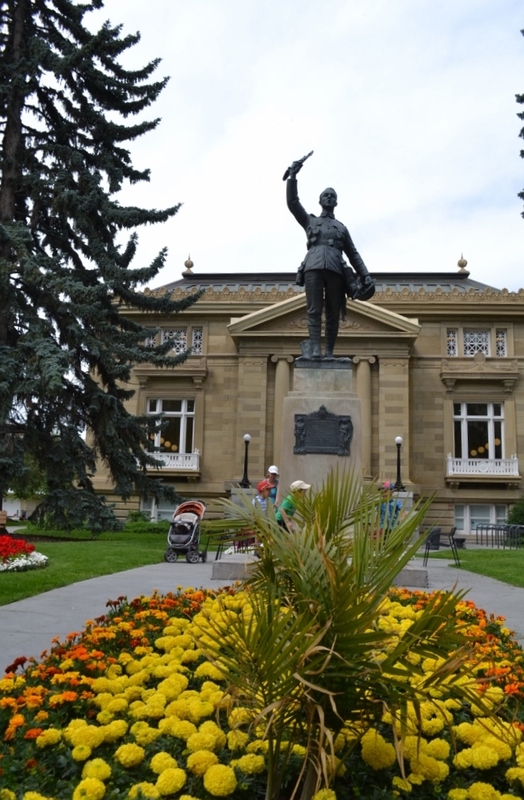 Today I want to recognize this historical fact by talking about the WWI memorial sculpted by Coeur de Lion MacCarthy [British/Canadian, 1881-1979] located in Calgary. It is currently located on a plinth placed directly in front of the Memorial Park Library (a.k.a. Carnegie Library) in Central Memorial Park. It has resided there since it was placed in the summer of 1924. Sadly, I had a lot of information about this work as a result of my research on the Amazon sculpture, but unfortunately much of this information disappeared in a data loss about a year and a half ago. So some of this information is from memory, but most of it is fact. Coeur de Lion MacCarthy [British/Canadian, 1881-1979] was one of 13 children of the British/Canadian sculptor Hamilton Thomas Carlton Plantagenet MacCarthy [1846-1931]. Since Hamilton MacCarthy, Sr. was sculptor of note, it is fair to say that the younger Coeur de Lion came by his skills honestly. Couer de Lion is often remembered for his commemorative sculptures, especially of those from WWI. He did a number of variations on the theme of a single soldier with a rifle are also found in places such as Lethbridge, Alberta; Verdun, Québec; and Niagara Falls, Ontario. A much more dramatic pose of a soldier with bayonet drawn and attacking is found in Trois-Rivières, Québec. In addition to this the Canadian Pacific Railway also commissioned Coeur de Lion to produce a monumental allegorical sculpture of an angel carrying a soldier in an edition of three as a memorial to its 1115 employees who fell in active service during the war. These CPR commissioned sculptures were installed in Vancouver, BC (1921); Winnipeg, Manitoba (1922); and in Montréal’s Windsor Station (1923). Another allegorical sculpture is also found in Knowlton (Lac Brome), Québec where the angel is standing behind the standing soldier with a rifle resting on his soldier as if it is protecting the soldier. 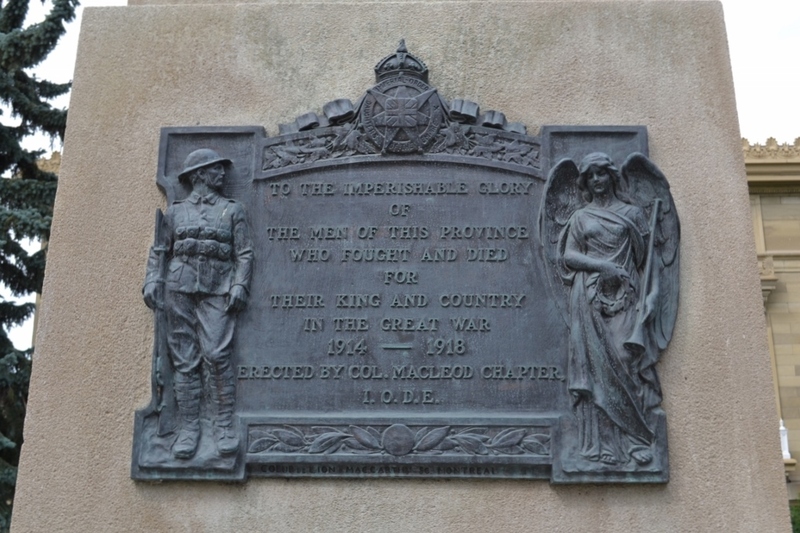 To the imperishable glory / Of / The men of this province / Who fought and died / For / Their King and Country / In the Great War / 1914-1918 / Erected by Col. Macleod Chapter, / I.O.D.E. The placement of this sculpture is interesting to me as I wrote a previous article and couple postings on the Amazon sculpture (which I believe was the first situated piece of public art) placed in the city during 1912. I am sure this fact will disappoint others who might suggest otherwise assuming that it would be the other sculpture located in the same park. This viewpoint is a fair assumption, even though it is not true. It is a moot point, for various reasons, namely because it was possibly proposed before the Amazon piece. However because of the commissioning process and funding it probably took longer to install, whereas the Amazon piece was most likely already cast at the time it was proposed. But this position would seem to exist because it is the only remaining public sculpture from that vintage on public display in Calgary and hence the phrase “out of sight, out of mind.” The work usually referenced this way (case in point) is the Boer War Memorial by Louis-Philipe Hébert (1850–1917) of an equestrian rider which I have discussed previously, both here and in print. Since attending the meeting of your committee in Friday, I have examined the proposed site for the War memorial in front of the Public Library, and would suggest that, instead of placing this in the position now occupied by the small statue, it be placed in the centre of the plot midway between the library entrance and the street, as I believe it would have a better appearance in that position. I would suggest that this letter shows the future direction of the Amazon sculpture which was produced after a work by August Kiss [German, 1802-1865]. I will continue to argue that the original selection was a very good choice as a war memorial, and its location was very thoughtfully placed. Unfortunately there were other circumstances at play. This Amazon sculpture most likely was damaged and disposed of at some unknown time, probably in the 1940s or 1950s, if I was to speculate. If you want to read more about this Amazon sculpture read my previous blog posting here. I expect that we will be hearing more about the 100th anniversary in the weeks to come. One of the more interesting things that will take place in Calgary is the opening of a new thematic show Wild Rose Overseas: Albertans in the Great War which opens at The Military Museums this afternoon and will continue until December 15. Almost a year ago I started writing in this blog. It was something that I started thinking about while bended over with shovel in hand and trying to figure out what form I should take the significant research on Calgary arts organizations, spaces and places, I had done up to that time and subsequently. My first post on this blog last August was about gardening. I had just started preparing the last part of my yard that needed significant change after working at least a month without a single day off of 12-16 days until I was laid off, working mostly in High River trying to restore a sense of normalcy to the community that was deeply affected by the flood. I started with a loose idea that I wanted to put in flowers, but as time progressed it became more obvious that I wanted to create a large flower garden and get rid of all the grass altogether. 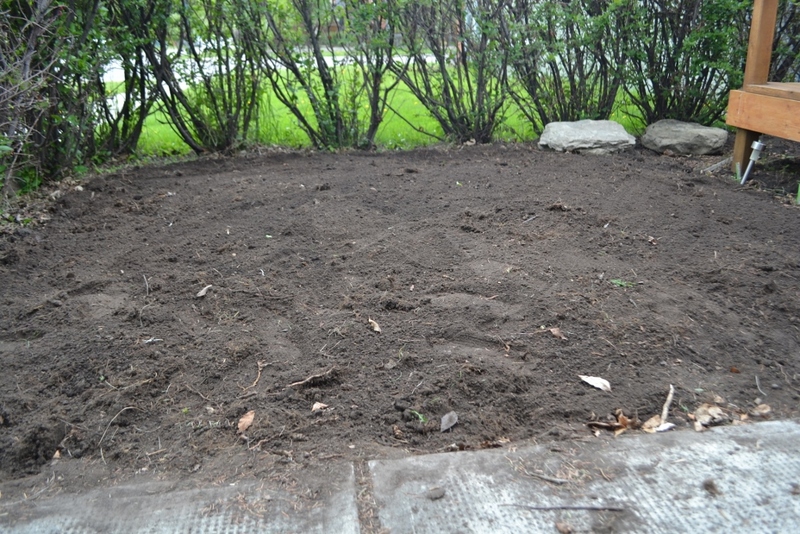 I also restored the depleted nutrients in the soil with composted material when doing this. I still have a small part of the lawn under the tree that still needs to be done, but the hardest part of my project is now complete and ready to plant. The part that I never properly anticipated was that there is a very large tree with a well-developed root system close to the surface. This meant that I had to go much slower than planned. I had to use a shovel and do a little bit at a time whenever I had a block of time available that I could devote to this task whenever the weather was nice. When I started digging in this part of the yard, it was mostly covered in grass that was spotty, probably was neglected, and not doing all that well. Something definitely needed to be done. Under the grass there was rocky soil and construction waste as the place underwent a significant restoration before I moved here. 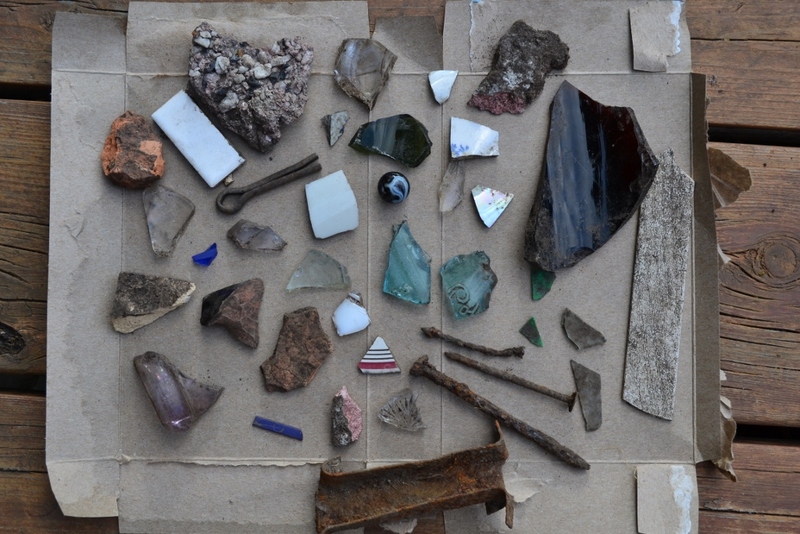 In amongst that waste was accumulated broken bottles, wine glasses, beer bottles, dishes, clothespins, a few pennies and other waste that was never cleared properly over the past 100 years or so that this property has been occupied. I have been digging in my garden for years. . . It is hard work that is often unrewarding. But, like many things in life, hard work is often a necessary element to create the conditions for future success. What visible reminder I have to show for all this hard work, is a vast collection of rocks. Big, small and everything in between. It is not really a collection I want to keep, but it reminds me of the progress that comes from doing all this back-breaking work over the past couple years. I am going to put in a collection of various wild flowers. It should keep the bees, butterflies and birds happy this summer and put a smile on the face of people walking past. More importantly it will make me happy too. Now if only that same dedication I have put into this and other areas of my life would pay off to the same extent. I am still looking for that full-time sales professional or arts administration/consultant position. Finding it is long-overdue. Today I want to talk about something that shares a lot of attributes with sculpture, three-dimensional art-making and public sculpture. But it is none of the above. Tonight I was walking through the +15 of the old Petro-Canada Centre (now Suncor Plaza). I had not been that way for quite some time and because I was not in a rush to get home tonight, I went a different way. I was glad that I did and that I had my camera with me too. It was dark already. As I entered the building, all I could see was scaffolding with darkness behind. When I got closer I was surprised at how beautiful the large atrium was with all the scaffolding stacked from floor to ceiling filling the space to capacity. I also looked at the illuminated airplane differently, as it was the only object lit and the focal point of the entire lobby. It was almost surreal in its orientation. This plane (a Noorduyn Norseman V) which is on loan from the Aerospace Museum of Calgary, has hung in the atrium for as long as I can remember. It was in its present location when I used to work in the East Tower on the 29th floor, back when I did a year-long contract for TransCanada PipeLines, before they built the new tower across the street. Under this plane I remember purchasing a small Norfolk pine from a Junior Achievement group, one lunch hour in the weeks leading up to Christmas. I was with my most favourite administrative assistant that I had the pleasure of working with, Ramona. She was awesome. We spent our lunches together almost every day, until she left. She helped me decide on the name for the plant – Elvis, in the hopes that optimistically, it, like The King himself, would live forever. Alas, it was not be. However, the plant lady who used to water all the plants for the executive team on my floor, heard that my plant was called Elvis. That was all it took to hear new stories from the plant lady about her groupie experiences attending concerts following The King around North America. It was the best $3 or $5 investment I ever made. If she saw me in the years after I left the company, she would always ask how Elvis was doing and tell me a new story. I never got tired of hearing them. They always made me laugh. Normally I don’t give the airplane much thought. Tonight as I got closer, the light was quite striking as it cast itself upon the airplane as if it was an object in space – which I suppose it is. Today, however, it took on a different hue. This time it was different. Very different. It was almost as if I was doing a studio visit to a sculptor’s studio. It was as if I was seeing an unfinished work in progress that is being held in place by the framework, with all the sprues still attached to the sculptural object, and lit for maximum effect to discuss which direction the work should go. After taking a few photos, I talked to one of the workers who was wearing a safety harness and getting ready to climb the scaffolding. I asked him what is happening with the plane. In his pleasant Newfoundlander accent he told it is not going anywhere and that they are starting to take down the scaffolding. 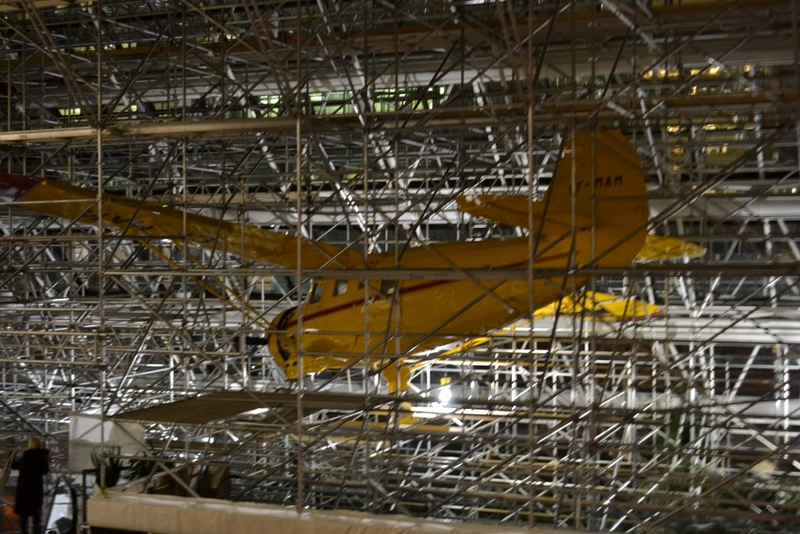 They painted the interior of the building, cleaned from top to bottom and will leave a reduced scaffold so they can clean the airplane once they are done. They have been working on it for the past month or so and will be finishing up soon. It looked so beautiful tonight. I am glad I saw it while the lobby was in a transitional state. 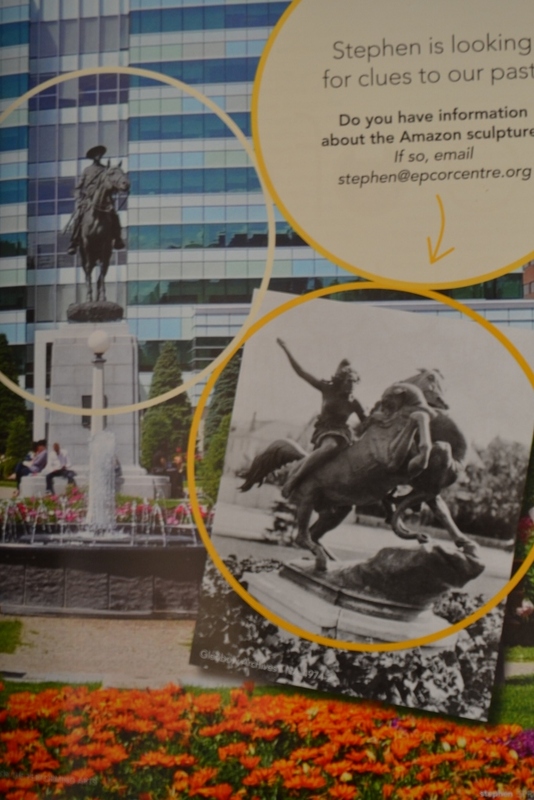 Yesterday the new issue of Stephen which is published by Epcor Centre came out. Recently I talked about a blog post written by Christine Hayes from the Calgary Public Library. It referenced a previous article that I wrote last Spring, which was published by Stephen magazine. The follow-on story is located here on pages 29 and 30. 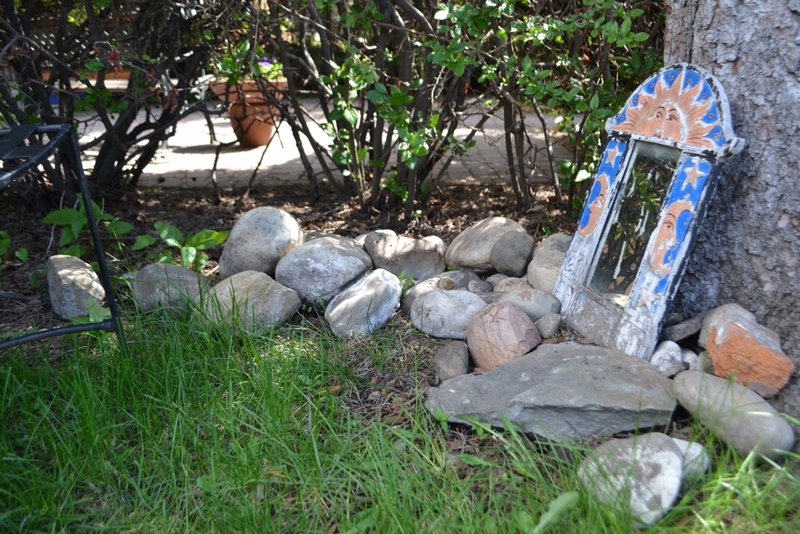 Briefly, both articles talked about the first piece of public art placed in Calgary. An early Parks Superintendent, Richard Iverson, who worked for Kaiser Wilhelm is important to this story. He was hired in 1910 and subsequently fired (or told to resign, I can’t remember which) in early 1913, which occurred within a few weeks of when Thomas Mawson (of the Mawson Plan fame) was hired as the town planner for the City of Calgary. During that short period of time, Iverson proposed installing a copy of a well-known piece by the German sculptor, August Kiss [1802-1865] entitled Amazon on Horseback Attacked by a Lion (or alternatively Panther) in front of the Carnegie Library in Memorial Park. Subsequently, it was moved, was put into storage (in the 1940s) and subsequently seems to have disappeared. Hence the mystery. I mention the Mawson Plan as I think this is material fact to why Iverson was let go (at least in part). He also had a run-in with the law in 1912 for violating liquor laws. I can’t remember the exact specifics, but he was somehow involved in a speakeasy or after-hours club or something like that. He was taken into custody and in the end was found not guilty of whatever he was charged with. He also was accused of doing private work using City resources by the group which his successor was the secretary of. The secretary of this group had also applied for Iverson’s job previously. Based on what I can determine, Iverson was an interesting character. As I recall reading, Tom Baines the long-time zoo educator (or whatever his job title was), wrote that Richard Iverson was probably the city’s first feminist (or something to that effect). Iverson also was probably polarizing in his personality, as I suspect there was a love-hate relationship with him amongst many. That is neither here nor there, but an interesting back-story nevertheless. Using that as context, I have a bit of unfounded speculation about the Amazon sculpture and Iverson’s plans. It is entirely speculation, so take it with a grain of salt. 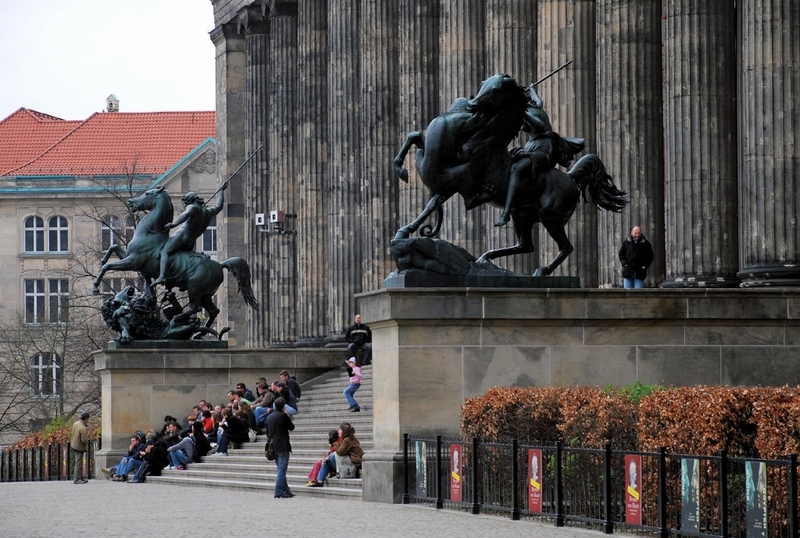 There is a large sculpture of August Kiss’ Amazon located at the Altes Museum in Berlin. In addition, there also is a large copy of it located in front of the Philadelphia Museum of Art which is owned by the Association for Public Art (formerly known as the Fairmount Park Art Association). Central to my speculation, is that both of these sculptures are located to the right-hand side when facing the main entrance of both buildings. In front of the newly built Carnegie Library, Iverson also placed the zinc Amazon sculpture on the right hand side just like the other two institutions. At the Altes Museum on the left side is a sculpture by the German artist, Albert Wolff [1814-1892] entitled Löwenkämpfer or alternatively, The Lion Fighter. To the left of the Philadelphia Museum of Art main entrance there is ironically placed a large sculpture also by Albert Wolff, coincidently also called The Lion Fighter. Is this a coincidence or planned? Hard to know. Based on that information, and furthering my speculation, I feel that Iverson also planned to install a smaller zinc version of Albert Wolff’s sculpture The Lion Fighter to act as a companion to the existing August Kiss sculpture. Around the same time that the Amazon sculpture was installed, a second public sculpture was proposed by lawyer Major Stanley Jones [1876-1916] et al, for the park. It placed as a memorial for those who fought in the Boar War Memorial. It is a very fine, major equestrian sculpture by Louis-Phillipe Hébert [Canadian, 1850-1917] which still stands in the park. There also were two medallions commissioned from the artist at the same time – one of Queen Victoria and the other of King Edward VII (which was removed at some unknown time and a replacement medallion was commissioned). There is quite an extensive write-up about this piece located here, even though there are some noticeable inaccuracies in the content of the website, the content is generally very good. Given the nature of this park as a memorial, once again I will travel down a speculative road. Unfortunately, I had a huge 800+ page digital file containing extensive research notes and information on public art in Calgary on my old computer. It evaporated off my hard-drive around this time last year. As a result I must go from memory alone on this. Around the time the Amazon sculpture was installed (or proposed) the Hébert sculpture was also proposed. There is the potential for interesting speculation – I wonder if there was some discussion between Iverson and Stanley for future planned use of the park as a memorial site. Regardless, we know that the Amazons were important part of Greek mythology as warriors. As such the placement of this sculpture in front of the library, which serves as a seat of knowledge, was quite thoughtful and inspired especially given the future use of the park as a memorial. It would also be interesting to know given that (if it is fact, which it may not be), whether the organizers and the parks superintendent at the time of the installation of the I.O.D.E. sponsored WWI sculpture by Couer-de-lion MacCarthy [Canadian, 1881-1979] were aware of this context. Of course, we are dealing in second guessing. If this was known, might the MacCarthy sculpture been positioned elsewhere on the park. If so, where? Back to the Mawson plan. I think that Iverson had grand ambitions for town planning which involved cultural properties and assets. I base this on the ambitious projects he undertook on the time he was here. To continue my speculation, I assume that when Thomas Mawson was doing his grand tour of Canada, it might have been easier to hire him and make Iverson expendable. As stated, this is rank speculation on my part, but it is an interesting speculation nevertheless. Based on my conversation with Christine from the Public Library yesterday, she will most likely have more information in her upcoming blog posting on the library site. I look forward to hearing what she has to say. Now for the sales pitch. At the time of writing the Stephen magazine article, I became aware of another copy of the August Kiss sculpture Amazon on Horseback Attacked by a Lion (or alternatively Panther that is currently available on the market. Is this the same piece as was once in Calgary? Who knows? Maybe it is still in a crate in a warehouse that has not been opened for decades. Maybe it was sold. Maybe it was scrapped. We may never know what actually happened. As stated in the Stephen magazine, that this work and others are available in the market periodically. If someone wanted to step up to the plate and purchase this work as a potential donation to the City of Calgary Civic Art Collection, I am of the opinion that this would be a phenomenal addition to the collection. I would be very willing to help broker this deal and put the two parties together. This sculpture deserves to be in Calgary. Although neglected at one time and probably defaced and or damaged, this is our history. We should be proud of being essentially a small-town in the early 1900s with grand ambitions and the balls to put a piece of public art on display that was probably risqué at the time. Kudos to all those involved. Who knows, maybe it will be just like the blue ring 100 years from now. It is a very important part of our local history and we should have it here. This afternoon when searching for something else, I stumbled across a blog post that the Calgary Public Library posted about a month ago in December in their Community Heritage and Family History blog – entitled Whatever Happened to the Amazon Sculpture? It is about the mystery of a missing piece of public sculpture once located in the city, and originally situated a little over 100 years ago. The public library article draws from something that I wrote about the Amazon sculpture almost a year ago for a magazine called Stephen (see page 31). It is always nice to receive their acknowledgement for the previous work that I have done, especially since there was a lot of unpaid research undertaken to write that article. Without going into further detail, all I will state is that the new issue of Stephen that covers the period January-April 2014 should be released within the week if all goes as planned. I understand from the editor, there will be two articles in that issue about the Amazon sculpture. One will be a first-hand account of some sort written by a lady who lived across the street from South Mount Royal Park whom I have met, along with some photos dating from the time she lived there. In addition there will also be an article written by myself. So in that context, what is the fun of it, if I let others know what is contained in a hard-copy written form before it is published? We have waited something like a half-century to find out. What is a few more days. Watch for the new issue as there could potentially be some answers in it. One of the things I like a lot is how the city beautifies Stephen Avenue Mall and other select other areas around the city. A couple nights ago I was leaving the Performing Arts Centre and saw this which has been out there since before the snow fell. It is little touches like this that makes the city beautiful. Reading that statement I just wrote makes me wonder if this would meet with Thomas Mawson’s plans for the city from long, long ago. 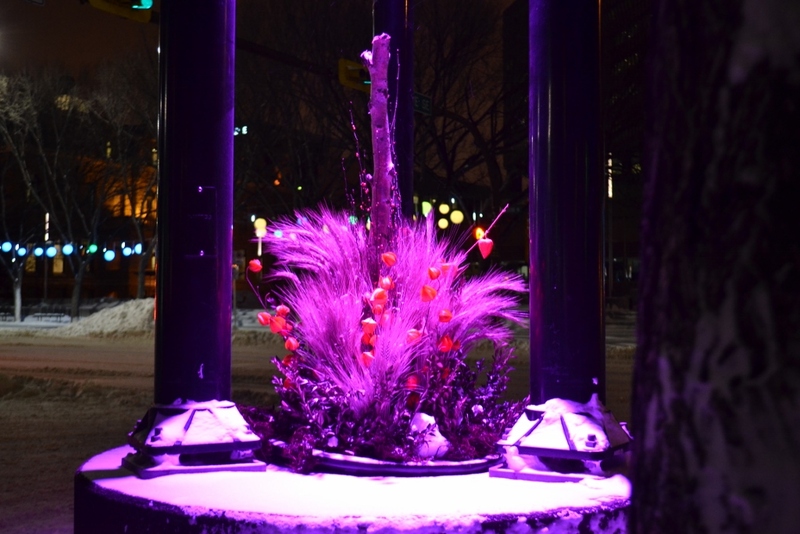 Expect to see a new light installation on the Stephen Avenue Walk that was planned to be up and installed last night, just outside of the Art Gallery of Calgary. This should be an interesting light installation entitled Solar Flare which I will plan to write about when fully installed, once the extreme cold weather warms up sometime during the next week.